Last year’s presidential election laid bare the impact of fake news on our democracy. In response, there was a rush to create countermeasures. Facebook and Google both banned fake news sites from their advertising networks, and news organizations like the BBC announced they’d launched their own anti-fake news taskforce. So, it feels inevitable that someone would create a fake-fake news factchecker. 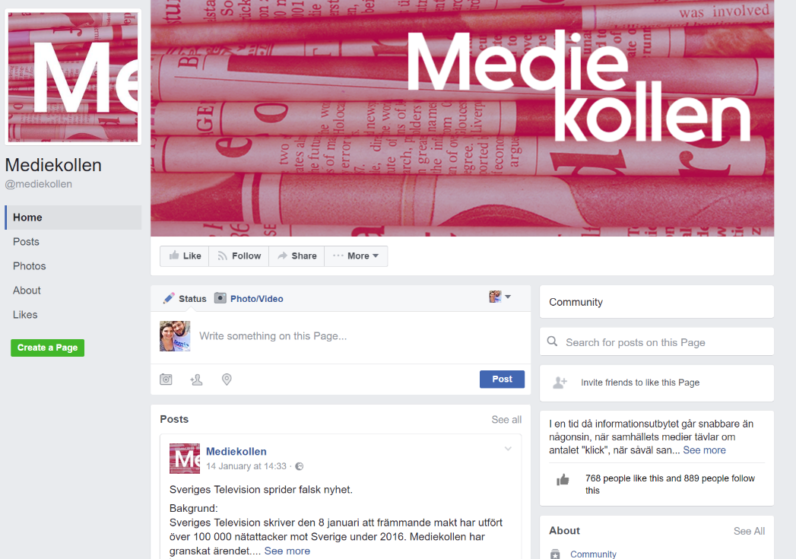 In Sweden, a group has emerged called Mediekollen, which promises to debunk false information. Except, as the Guardian pointed out, Mediekollen is itself a “tool of disinformation”. When it covered the controversial Donald Trump intelligence dossier, in addition to saying that it could not be verified (which every news organization that’s covered it has emphasized), it also said that it originated from a 4chan hoax, which is categorically untrue. And when Swedish author Katerina Janouch said to Czech TV that the country had more than 50 “no-go” zones for police, it responded with a series of statistics that backed up the allegation, along with links to opinion pieces. Except the claims made by Janouch were fundamentally incorrect, and after challenged by a major Swedish newspaper, she retracted them. Anders Lindberg, a journalist at Aftonbladet, discovered Mediekollen after readers contacted him in support of Janouch, along with links to the Facebook page. Writing in The Guardian, Jasper Jackson emphasized that while much of the information Mediekollen uses is based on fact, it’s often cherry-picked, editorialized, or contorted, so as to be misleading. Mediekollen depressingly emphasizes the point that the war against fake news isn’t remotely close to being won. In fact, the noises of disinformation are louder and emboldened, and are adopting the terminology and techniques of those who oppose them.